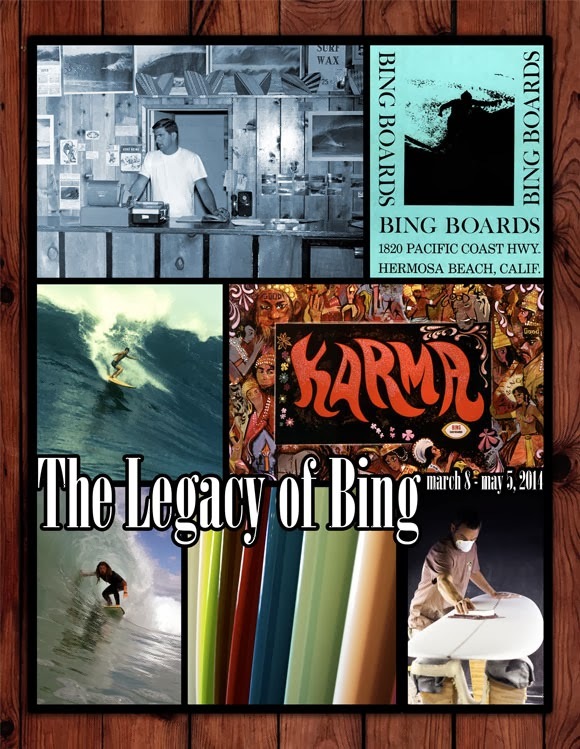 Surfing Heritage & Culture Center: The Legacy of Bing Exhibit Closes May 15! Bing Copeland began surfing in 1949, at age 13, at the Manhattan Beach pier with his friend Greg Noll, who was a bait boy on the end of the pier. Bing and Greg were surfing gremmies that began their friendship hanging on the railing watching the older guys surf the big heavy redwood boards. Bing opened his first surf shop in the fall of 1959. We're displaying a timeline of Bing surfboards-with an emphasis on original classics-up through the transition years, and culminating with the latest models being produce by Matt Calvani at the Bing factory. We'll also have historic photos, vintage ads and other material from Bing's 55 years in the business. Last October during the Boardroom at the OC Fairgrounds, I casually mentioned to Bing that I’d like to do an exhibit of his boards. He was probably thinking, “yeah, right, we’ll see,” but being the gentleman that he is, he kept that to himself. Well, here it is less than half a year later and we’ve pulled it off. Thanks in great part to Bing collector, Tom Moss, we were able to gather and display an amazing cross-section of mint and cherry Bings, highlighting his ‘60s and ’70s classic longboard and transition era shapes and designs. I’d like to thank Margaret and Matt Calvani and the Bing shop in Encinitas for sharing some new models from the current Bing line. Matt has taken up where Bing left off, and continues to push the design envelope with some updates on the classics and all new shapes that spark the imagination in the fun factor realm of surfing. I’d also like to thank Bing for his contributions to making the show a reality, to my coworkers for indulging me to do this show during a time when we’re all already working past our breaking points, to our sponsors at Daphne’s California Greek, Primo Beer, and Hawaiian Spring Waters, and lastly, to Hal Forsen for his invaluable help during the exhibit install.